FDD president Edith Nawakwi has pledged to construct a dip tank for the people of Chief Muchila in Namwala district, Southern Province. And Chief Muchila of the Tonga people in Southern Province has bemoaned the lack of development in his chiefdom. Speaking when she paid a courtesy call on his royal highness, the opposition leader said it was sad that people in the area were being forced to walk more than 40 kilometres to dip their animals when government could could help construct the facility. She says the government could just mobilise the community in the chiefdom and facilitate the building of the facility by providing expert knowledge and other necessities such as cement and iron sheets. She wondered how animals expecting would move for 40 kilometers just to have them dipped when they are supposed to be grazing to stay health. “I am a farmer and I understand these challenges. I am therefore, your royal Highness, leaving you with a task of organizing your subjects and finding a suitable place to build a dip tank. I going back to Lusaka to source for funding from your sons hiding in Lusaka so that we can build a dip tank. That’s why as FDD we believe that the best way for communities to move forward and the country to eradicate poverty is by decentralisation. We believe that when people are given powers to decide for themselves what they need in their areas we will see development rolling out simultaneously.” Ms. Nawakwi said. She adds that as a party they believe that the best way of helping communities is to facilitate for the implementation of the projects chosen and wanted by communities and not just thinking on their behalf. And Chief Muchila has bemoaned the lack of development in his area saying its like government does not know that they exist. The traditional leader who was grateful to the opposition leader for finding time to visit his area said the it was difficult to feel part of the country as government had neglected them. “I’m grateful that you have come to visit us here and see for yourself how we have been neglected in this area. We are living as if we are orphans, as if we don’t have a government. In this area we have a number of challenges which we think you as some one aspiring to lead this country should be aware of. We have to walk our animals for 40 kilometers to find the nearest dip tank and as you know this area is the worst affected by cattle diseases.” He said. He noted that he has heard that government is building houses for traditional leaders but that it seems only a few are benefiting from that initiative while the rest will continue to live in their grass thatched hats. Chief Muchila further said his Chiefdom depends on farming and facilities such as roads are important. “The other thing is as you have probably seen for yourselves the road is bad our government can’t even send a grader to help have a decent road. Other infrastructures such as schools and clinics are nothing to write home about,”explained the traditional leader. The traditional leader further advised other politicians not politicize Ms. Nawakwi’s gesture saying people should not stop helping those in need in the name of politics. Nice work Ms Nawakwi!! Seriously an MP for the area with CDF should have been able to do this. It is crazy that everybody expects the government to even empty trash in their backyard. Those people have a member of parliament who my guess is from UpDn. They have been voting for the same member of parliament for donkey years. Why did they not raise the issue with the area member of parliament ? Now you are doing something not just running your mouth like a motor! What a load of nonsense! And this is what passes for an ‘analytical mind’! I suppose wherever this MMD Chief Bootlicker and Nawakwi hail from are areas where development has been achieved! Their homelands have everything because their sons and daughters in Lusaka have delivered it. CDF! CDF! And someone thinks this is all you need to deliver development! And how about the st.u.pid comment about HH in London? Some people should learn to act their age! 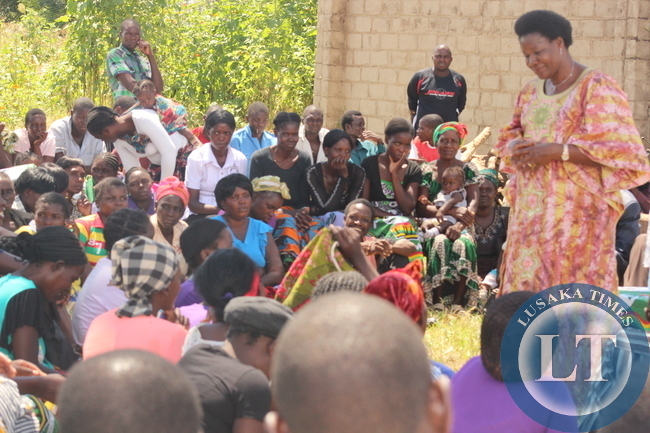 Iwe up to now only PF constituencies got CDF funds. Go and check the records before you yap. Even the so called youth funds, Kambwili has not given a single ngwee to the Southern Province youths. Why? Its shame that private citizens are having to do what PF gets tax money for. Nawakwi should be commended for reaching out to every Zambian irrespective of tribe just like HH has done will be doing in the coming mont. Your Ka Lungu, has not even gone to Southern province to see and reassure the people because he got less all because he did not sell himself very well. Be ware that the ground is indeed shifting and many people irrespective of their tribe have began to realise that HH is the man to transform Zambia for the better. To be honest with MMD bootlicker, those people in Namwala are 50 times better than than people in Nawakwi and MMD bootlicker ‘s home village. These people own cattle and a lot of it. Every family now can afford a TV, mobile phone, and a car. They are resilient after three years of PF neglecting them, they have weathered the storm. The dip will be an added bonus to them, but individuals have dip tanks which the rent out to others who do have. So with or without Nawakwi ‘s dip tank, they are relatively fine. Nawakwi remains a prospect for good deeds in political circles pa zed. She’s intelligent, speaks well and has made her mistakes which I believe she has learnt from. Her gender alignment might challenge the norms of societal expectations for presidency of a republic like Zambia. Dorika has created outrage in recent past so would Nawakwi if voted for presidency in 2016. Mama Nawakwi tulipanshi, mwabombeni. Go to Lusaka find more money and mother the villagers for now. ECL and HH are in China and London respectively you are ‘leading’ only by example for now. Well done you. Its only God who weathers, while us mortals withers…. Keep up the good work. We need practical opposition parties. Please do consider working with HH as a formidable team. I love you both and I know if you joined forces, 2016 will be porridge ( a common quote from ba kaponya). Have 2016 elections now so that by the time the others are back will be halfway counting. Nawakwi will be front-runner. I am sure those people voted for quality and can never trade a vote for cash. They are principled people who vote for what they believe in, wrong as it may seem to you bwana licker, don’t force people to believe in what you want. HH in in London and has not run away from anybody.I am sure you are on happy april’s day. instead of yapping at every move the govt makes…this is what i expect from any opposition leader. offering solutions and giving advise is what we lack in Sub-Saharan Africa. we are quick to condemn who ever is ruling at a particular time so that they fail (In the name of checks and balances). We ve got so many problems in the country right now…but if all well meaning politicians were to stand up and do this,i can guarantee it would be so easy to change/remove who ever is not performing. way to go ba nawaki…but ukulandalanda muchefye mufushe action!! Let the farmers learn to invest in affordable infrastructure such as dip tanks. Surely they can sell a few animals and raise the money to build one if the CDF funds have been withheld. If President Nawakwi cares to learn more let her inquire from the extension officers and she will discover that those people can afford. Let the government provide infrastructure that local people cannot afford. To me that is how development should be tackled and not through politicking. EZN is looking at picking up votes, chapwa. Good work Edith unfortunately those people can’t vote for a none Tonga. DIP yer jerks – DIP!!! You don’t DEEP those critters, yer DIP ’em!!! Fer Jakes sakes!!! Bwana, Mps are the eyes and ears of GVT. What Edith is doing is but she should let Shambulo build a dip tank for his chief. It is a good move not just vomiting ma rubbish. I advice all upnd cadres to start workin out,do sum exercises atleast.koz bafikalaa u r very fat!!!! Just how much does a dip tank cost? Flawed policies on livestock development are the reason for continued failures in this sector! If we have no capacity on how to go about creating a vibrant livestock sector an appeal for help could be sent to Botswana! Come to think of it the EU has given lots of aid towards livestock development yet what we hear or have just read about are civil servants getting arrested for misapplying this aid. President Nawakwii, what more can I say, have I not told you that she is the best competitor against EC. Lungu. While the MP of the Area is at parliament dozing or not even contributing. Brothers and Sisters, Ladies and Gentlemen or may I say fellow Zambians. Today i had a dream that a hand of Zambians especially alcoholics were mourning the passing on of the Kachasu Man. May dreams always come true. Help me pray so that this one can come a bit earlier; otherwise Zambia is sinking with a headless man in leadership. Let him face Embassy Park, it was created for useless people like him. NO MERCY FOR HIM. Who is this kachasu man u lyk talkin abt? Good works, you are a woman and a half madam. Let us appreciate great ones like Madam Nawakwi. Yes Nawakwi that’s right and the first name on the list of donors should be HH. How dare his chief has no dip tank which just requires less than K5,000 of materials like cement and he can organize the labour among the villagers? Instead of offering simple solutions he is busy gallivanting in London expounding high level theories. The votes are right here in Zambia bwana, as Nkamimba would say to Grevazio Zulu on Sunday interview. Ba chief kadya sorry cadre, did you really think through carefully before sending this? Madam kwakikwaki has done a wonderful thing but that should bring any other politician to donate if they don’t fwaya. Govt must do the needful. What do you think? Good. Now you are talking. Opposition is not just about talking-talking. if this is for real it is nice. if its just a gimmick, nooooo…. Nawakwi is seeking publicity all over. Certain cheap/petty activities do not have to get media coverage from a presidential material. Personal financies do not apply here. Offer modalities as you can’t manage Zambians through your money. Seek a lower seat like MP where your league seems to apply. These top two giants won’t allow you.The main problem in Zambia is management not the donor funding. Press the govt from your pasition positively and the citizens will decide otherwise you are far, Trend carefully and maintain your pace. 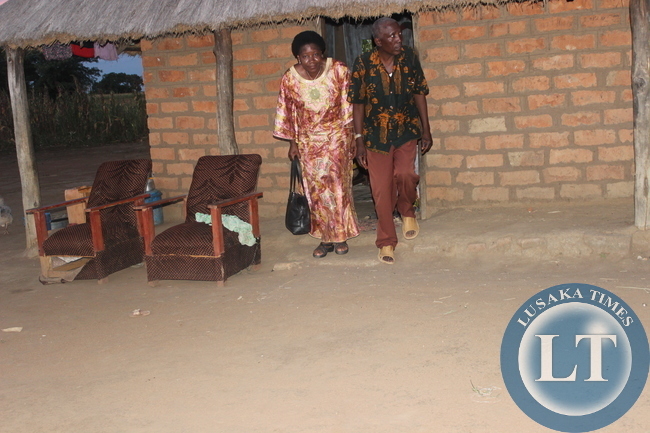 Nawakwi had the opportunity to build not only one but more cattle dips when she was minister of finance. To day she is just politicking for public sympathy which she is receiving on this blog. As things stand now she is waiting for E. Chagwa Lungu to invite her for a trip, late Sata took her along to Brazil and rewarded her with a job in Muchinga province. Kaya, seriousness on her rhetoric is doubtful. Thats how you can get some votes in that area nawaki. Job well done. Give them that dip tank and they will give you some votes as well. Do not just complain about nega nega formula like some fools after elections results. I like Nawakwi. I know she is in politics, but she is doing something commendable. I would like to see my president, HH, do something about this challenge. Also, I advise our people, Zambians, not to always wait on the Government to do something for them, but to take initiative and mobilize themselves and do such basic stuff. May the Lord Almighty bless Zambia. this is a pointer to both PF and HH. Edith has started being relevant atleast .instead of just insulting and causing quarrels she has grasped the meaning of checks and balances. yes, these people have wasted their votes for all these donkey years, all constituencies receive CDF funding, dont be cheated, UPND MP has been docile because he knows Tonga votes for Tonga even if they do not do their work. edith might even get zero votes in this ka chiefdom even if she builds the dip, she is not Tonga, period!!!!!!! PF also should not hold grudges, infact more effort is needed to de Tongalize voting patterens in Southern province, they should try to sober up and develop southern province in order to win the votes there. Surely you like Nawakwi. Go to Nakonde where she hails from and where she was MP for 5 or 10 years and see what she has done! Nothing and she can’t even hold a rally there. She is just politicking and a nice one for that matter. Why must it always be the government doing everything for it’s citizens. Certain small things can be done by citizens themselves. For example, how many cattle farmers are affected in this case and how many animals are we talking about? Why can’t each of these farmers sacrifice one oxen for sale to raise money to construct a dip tank? Be innovative and start developing yourselves instead of waiting for the government to come and build even pit latrines for you.